Antioxidant Vitamin C protects skin from free radicals and is essential in collagen production. Mario Badescu’s Vitamin C Serum contains 7.5% Ascorbic Acid (Vitamin C) to reduce discoloration and brighten skin. Also formulated with Hyaluronic Acid to retain skin’s natural moisture and Collagen to enhance skin’s firmness and elasticity. How to Use: Apply 2-3 drops on clean skin avoiding eye area every other night. May be used under a moisturizer or alone. Available for $45. This little miracle worker may be purchased in-store or over the phone. Another must-have product from Knock Out Cosmetics, the creation of celebrity makeup artist Mike Potter. 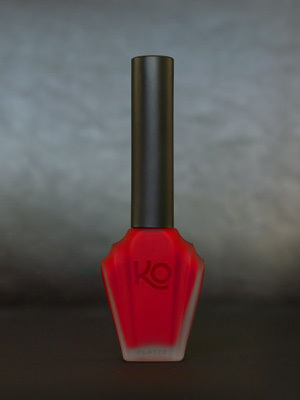 Karen is a bold, glamorous, knock-your-socks off, cheery, cherry red…the perfect antidote to April’s dreary showers. Inspired by two dear women in Mike’s life: his mother Karen, and Karen O. A parent and a rock star…whoddathunk? Don’t forget to use KO’s Flatte Top for extra durability and matteness (if there is such a word). Pick up a bottle of heavenly red Karen here. How much does Cutler love you? Enough to give you a fabulous travel kit (retails for $22) with any $100 miomia purchase (while supplies last)! The Cutler Carry On Kit includes the following: Daily Shampoo 1.7 oz, Daily Conditioner 1.7 oz, Body Wash 1.7 oz, Body Milk 1.7 oz, and Bar Soap 1.5 oz. Miomia can’t rave enough about Rodney Cutler, his lovely salons, and his fabulous product line. My heavily-colored tresses cannot survive without the Extra Gentle Shampoo, Intensive Conditioner, and Protectant Treatment Spray. Now you know my secret for keeping my inky blue-black hair healthy, shiny and protected from the elements. If you’re in New York and are looking for gorgeous cuts+color, look no further than Cutler. I can’t think of another “big name” salon in NY that provides cutting-edge services with zero attitude or hassle to buy products. In addition, Rodney Cutler exemplifies the very best kind of business owner; he is kind, gracious, dedicated, humble and cares deeply about his craft, his staff, and his clients. While all Cutler stylists and colorists are enormously gifted, I’d highly recommend Rodney (Midtown and Soho) and Anthony Joseph Hernandez (Soho location) for flawless cuts that grow out beautifully, and Rachel Bodt (also at Soho) for stunning color that lasts. My new short, swingy, springy hair is the work of Rodney Cutler himself. Check out Cutler’s website at www.cutlersalon.com for more information. Call 212-308-3838 to set up an appointment for the cut+color of your dreams. You are currently browsing the miomia's musings : miomia apothecary blog | shopmiomia.com blog archives for April, 2009.